Reports are viewable from the administration side of the program. Technicians will never see these unless you give them security clearance. Reports can be printed to a PDF. 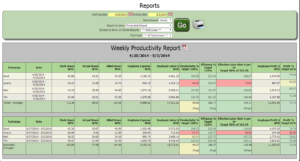 The reports are done in red, yellow and green to easily see how well your business is performing. 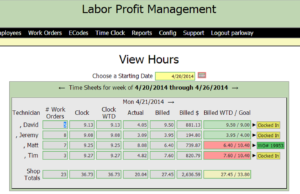 This report will show you how many work orders a technician produced this day along with hours present, hours produced, billed labor dollars for the day and where the technician is at compared to their goal. You can see each technician individually and the store as a whole. Far right shows the advisor what your technician is doing at the moment. 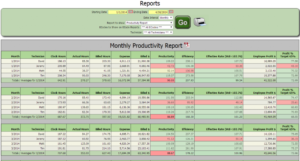 This is the same report as the weekly productivity report with the exception of showing the dollars. 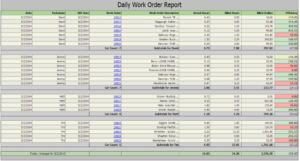 This is a good report to share with the technicians so they can see how they are doing on a weekly basis. You will find this helps with building your team of technicians. This report quickly shows how each technician performed for the week. 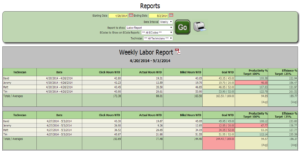 This report can be viewed weekly, monthly, annually, technician individually and the store as a whole. E-codes can be set up to your shop. This will show where your technicians were when not working on a vehicle. Will help identify issues with other parts of your business you may not know exist. Good for measuring how much time is spent on state inspections. This report quickly shows how each technician performed for the month. 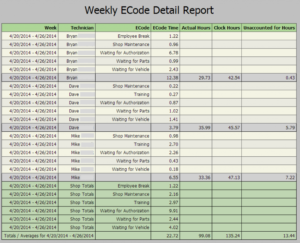 This report can be viewed weekly, monthly, annually, technician individually and the store as a whole. Easily identify where a technician is excelling or struggling. When looking at the efficiency you can see quickly if the correct technician was assigned to the job. Sign up here for our free training sessions!